Mental illness is something that is a great deal more common than many think. Statistics show that 1 in 5 North Americans will require treatment for a major disorder at some point in their lives. This means either you or a family member or friend close to you are very likely to be stricken down by a failure of our most essential and complicated organ in our bodies. When I was first treated for a mental health issue there was so much stigma and misunderstanding about mental illness that I completely denied I had a problem. Despite that mental health issues ran in my family, no one talked about them, everyone shunned those who were different, and as a result I wasted years of my life not understanding that there was help available and that I didn’t just have to ‘tough things out’. My denial and pain was so bad at one point I tried to join the military during the first Gulf War just to find a way out of life, I thought I would either gain the discipline needed to overcome my illness or die trying. I needed neither. Some find my story funny, some find it sad, but it is a story that is being played out among more people than you may think right now, right around all of us. Depression, Schizophrenia, Anxiety, Addiction. It‘s something we can no longer avoid, especially with America now deploying and redeploying troops en masse to combat zones where even the strongest among us can succumb to the pressure of such a situation. It is my hope that those who read this book can walk away from it having had a look inside the mind of someone who lost his mind and one day regained it, but not without first going through incredible pain and suffering. This suffering doesn‘t have to happen. What has to happen is that attitudes and knowledge have to improve. From a young age I showed promise in writing and poetry, and did well in school. Even in grade five I used to draw and write stories for my own comic books and post them on the bulletin board in class. When I got to high school, I began to read voraciously, and though I failed my first academic English course, I took continually more advanced courses and got higher and higher grades in them. I was hopeful to attend University and study English, but before I finished school I was stricken with a severe breakdown and had to be hospitalized where I was diagnosed with Bipolar Disorder. From that point, family and friend relationships broke down and I ended up sort of drifting until I signed up for Flying School in Vancouver, BC. In the middle of this training, I took off for the US with a friend and tried to join the US Army as a helicopter pilot. 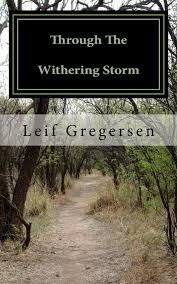 All of these adventures are detailed in my memoir, which covers my life from the age of 13 to 21 which was the point at which I decided I had to stay in one place (I had returned to Edmonton near my home town and where my parents lived) and I took treatment for my disorder and began to write seriously. 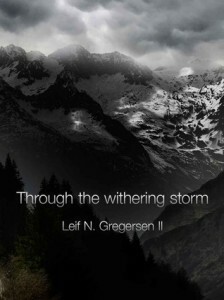 I spent some years just studying and writing poetry and then moved on to short stories, and my book, Through The Withering Storm is actually partially short stories I wrote and collected at that time. Now, since I turned 30 I have been living in an assisted-living house for males with Psychiatric Disorders and life has gone quite well. I landed a great job doing labour work/stage hand/security work for the stage and screen Union, IATSE. I have seen many concerts, worked closely with some big stars, and made enough money to continue writing and self-publishing my books, which have already paid for themselves in sales for the most part.